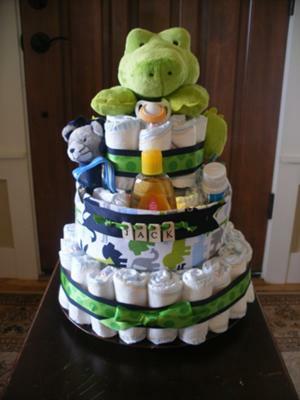 Take a look at Dee Dee's Alligator Diaper Cake! It's amazing what some diapers, some darling ribbon, some baby supplies and a plush alligator stuffed animal can turn into! It just took some simple directions, a couple of hours and a flair of creativity! Dee Dee has shared her super cute diaper cake with us to help 'pay it forward' and share her ideas with all those searching for diaper cake ideas. How cool is that?! We love your diaper cake, Dee Dee! Thanks for sharing! Share your diaper cake ideas right here! I rolled each diaper and wrapped with rubber band and placed on platter around the bottle. Continued the same with 2nd & 3rd tiers. Wrapped each tier with a larger rubber band to hold in place. Covered middle layer w/ receiving blanket. Put ribbon on other layers. I had to take some diapers out or move them around to make room for baby items tucked inside blanket on 2nd tier. Attaching the alligator to the top of the champagne bottle and around top tier was a little tricky but I used large rubber bands and tried to conceal them as best as I could. I used a hot glue gun to place the letter tiles on the ribbon to spell the baby's name and pinned the ribbon to the receiving blanket. I think it turned out pretty cute and my sister-in-law loved it. I can't wait to make more and try out different ideas. It's a very fun project. Have Fun! !